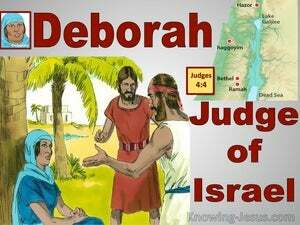 ﻿ Judges 4:4 Now Deborah, a prophetess, the wife of Lappidoth, was judging Israel at that time. 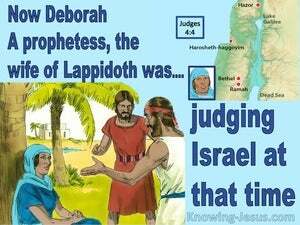 Deborah, a woman, prophet, and wife of Lappidoth, was herself judging Israel during that time. Now Deborah, a prophetess, the wife of Lappidoth, judged Israel at that time. And a woman judged Israel at that time, Deborah, a prophetess, the wife of Lapidoth. And Deborah, a prophetess, the wife of Lappidoth, judged Israel at that time. Now at that time Deborah, a prophetess, the wife of Lappidoth, [was] judging Israel. And Deborah, a prophetess, the wife of Lapidoth, judged Israel at that time. Now Deborah, a prophetess, wife of Lappidoth, was leading Israel at that time. 3 The sons of Israel cried to the LORD; for he had nine hundred iron chariots, and he oppressed the sons of Israel severely for twenty years. 4 Now Deborah, a prophetess, the wife of Lappidoth, was judging Israel at that time. 5 She used to sit under the palm tree of Deborah between Ramah and Bethel in the hill country of Ephraim; and the sons of Israel came up to her for judgment.